High in the Arctic Circle a bitter war of attrition was fought in freezing, unforgiving conditions, the desperate conflict played out against a majestic, awe-inspiring backdrop of beautiful ice-clad mountains. 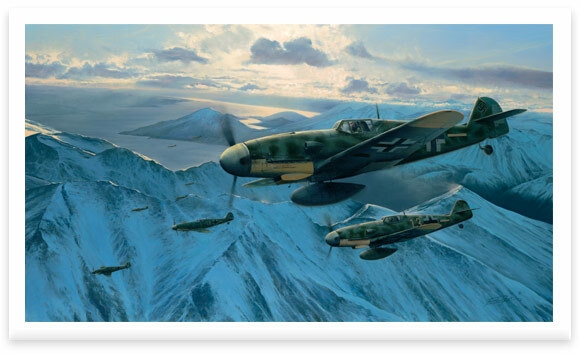 Richard Taylor's spectacular new painting portrays the Me109s of 6./JG5 led by Oberleutnant Heinrich Ehrler, while based at Petsamo in Finland, as they soar high above the towering peaks of ice capped mountains glistening in the cold polar air, March 1943. Their dawn patrol keeps constant vigil along the glacial fjords of the Norway's far-northern coastline, as the majestic vista gives the battle-hardened Me109 pilots a brief moment of tranquillity far removed from the grim and bitter battles being fought below. Richard's new edition is signed by Luftwaffe fighter Aces who were on the Polar Front, including two of the top fighter Aces in history, guaranteeing this fine limited edition a place in the portfolios of all serious collectors. 60 Polar Front Editions UK £120.00 SOLD OUT!